Most of us probably envision a beautifully calm and peaceful birth. I was flexible with my birth plan, knowing anything could change at any given moment, but mostly? I wanted a water birth with no pain relief except for gas and air. I wanted dimmed lights, a mix-tape of my favourite metal music and perfectly shot photographs of me cradling my newborn in the birthing pool. I wanted delayed clamping of the cord, immediate skin-to-skin and the vernix to be kept on my baby as long as possible. Instead? I had two failed sweeps, had to be induced at 41+5 days and spent 19 hours in labour before the decision was made that I needed an emergency caesarean. Having never even sprained an ankle before, going in for major surgery was scary, and I was extremely high-risk due to my size and weight, but who knew the surgery would be much smoother than I thought, whilst the recovery would be anything but easy. Obviously, you can encounter complications with a caesarean regardless of your size, but my own personal experience of an emergency caesarean has left me believing, without a shadow of a doubt, that I wouldn't have encountered many of the complications that I did, had I not been plus size. I did a lot of research into caesareans when I was pregnant, as with Willow being transverse breech until 38 weeks, it was a possibility I could have ended up with a planned section. Everything I read about plus size women having caesareans was along the horror stories line, and unfortunately many of the issues I read about both on pregnancy forums by mothers themselves and studies and statistics relating to plus size pregnancies, I have encountered at some point in my recovery. The surgeons and anaesthetist also discussed my weight with me before the surgery started, and it was made quite clear that my weight would make my ceasarean more difficult than the standard c-section. This isn't for the faint-hearted and has some very personal information about my own personal experience. As I said before, this won't be the case for everyone and I am sure women of all sizes can experience the issues I have had, but I feel I would have encountered far fewer problems if I was slimmer during my recovery. Here are 5 things I wish I had been told and been able to prepare for, both physically and mentally, 13 months on from my caesarean. 001. You are likely to be high risk. Throughout my pregnancy, my midwife told me I was low risk and we even discussed and planned a home birth. By the time I was 2 weeks overdue and 19 hours of labour had shown no signs of Willow making an appearance, it was time to discuss an emergency ceasarean and what would happen. At this point, I was told I was extremely high risk and even at my starting weight pre-pregnancy of 6.5 stone less than I was at the time, I wouldn't have been low risk. This had an effect on my ceasarean because the epidural simply wasn't going to work; I could still feel everything and all of the tests they do when they top up your epidural, which the anesthetist informed me was because of my weight. Instead, I had to have a spinal block, which was pretty scary at the time as they had to explain to me all the terrifying outcomes you don't want to think about when you're on an operating table. 13 months on I still get severe back pains where the spinal block was administered, and if you touch me in the exact spot, I scream in excuriating pain. Apparently, this is quite common after a ceasarean, to still have back issues and for the area where epidurals and spinal blocks were administered to still feel extremely tender and sore. I have no idea whether this will be a life-long side-effect, or if eventually, the pain will go away. 002. I was told recovery would take 4-6 weeks, in reality, it was a minimum of 4.5 months before I felt I could even say my scar was finally healing. I'm sure if my body had been smaller and I didn't have a very large overhang with my stomach (what many mamas call a 'mother's apron' but I refer to as my 'pouch'), then I am sure healing would have been much quicker. For me, it took much longer than the 4-6 weeks I was assured it would take, by the surgeons, hospital midwives, community midwives and health visitors. I think 4-6 weeks is an incredibly short period of time for anyone to recover from major surgery anyway, but when you're over 20 stone by the end of your pregnancy (anyone else put on 6.5 stone when pregnant?) and have an incredibly large stomach which hangs over your scar, it simply isn't that quick and easy to recover. A more realistic time-frame would make such a difference, and save a lot of anxiety when you go past the 4-6 week period and wonder why you are still struggling to get back to normal. 003. You will constantly be cleaning and checking your wound as it heals. Having such a large stomach overhanging my scar meant I encountered some difficulties in keeping the area clean and dry. The area can quickly become sweaty and risk to infection and you will spend a lot of your time naked from the waist down, just to try and get some air to your slowly healing wound. I became obsessed with checking my wound, using a mirror to get as close as possible to check if there was anything wrong and most times, I found I had yet another infection or, my worst fear realised, had torn my scar and opened up a hole which was weeping. I spent every night lay in bed Googling healed ceasarean scars, comparing it to my own, and saw both perfectly healed scars which made me panic, and the worst-case-scenarios, which made me terrified of what else could go wrong. Pro tip: don't Google! 004. Thrush is likely to become a regular thing. Who knew you could get thrush anywhere on your body? Not only did I not know oral thrush was a thing, which Willow caught when she was a couple of months old, but apparently any part of your body that is warm and damp, i.e. creases and folds of skin, can be prone to getting thrush. Thrush seems to be an incredibly common symptom for plus size women who have caesareans and I have now had it on along my scar more times than I can count. It is one of the worst consequences, for me, to arise from having a caesarean, and although it has never been anywhere near as severe as some of the images Google throws up (again, don't Google! ), it certainly knocks me for six each time it happens and makes me feel incredibly self-conscious. 13 months on this is still an issue that crops up every few months and I know it will continue to happen unless I lose weight, which is handy as I have rejoined Weight Watchers back in February, which I shared in my recent feature 'I don't want to be body positive'. 005. Recovering from major surgery can make life with a newborn so much harder. I felt I was really restricted in those first few months, with what I could do. It was a struggle to get out of bed, or even get into it. Turning over and moving about in bed at night was always tied along with pain and I soon felt scared to move in case of being left reaching for the paracetamol and diclofenac. Bending down was excruciatingly painful, coupled with the fact your stomach muscles are ruined during pregnancy, it made picking up my daughter and doing general everyday things much, much harder. It felt like every moment was made worse by my stomach; like a weight pulling down on my scar and causing movement every second of the day. They tell you to take it easy after childbirth, but particularly after a ceasarean, and that's advice I didn't listen to. Please do not follow in my footsteps, because I was told off numerous times by my GP for overdoing it, which he felt was the cause of me getting repetitive infections. Make allowances for the fact that during those first few months, you are pretty much out-of-service. Be gentle to your body as it heals, leave the housework for another day and concentrate on your little one. Visitors come to see your beautiful new baby, not the pile of dishes in the sink or the piles of washing in every room. Having a ceasarean is a huge thing to go through to ensure our babies make it here safe and sound and for me, that was the option we had to take in order to get my little girl here safely. 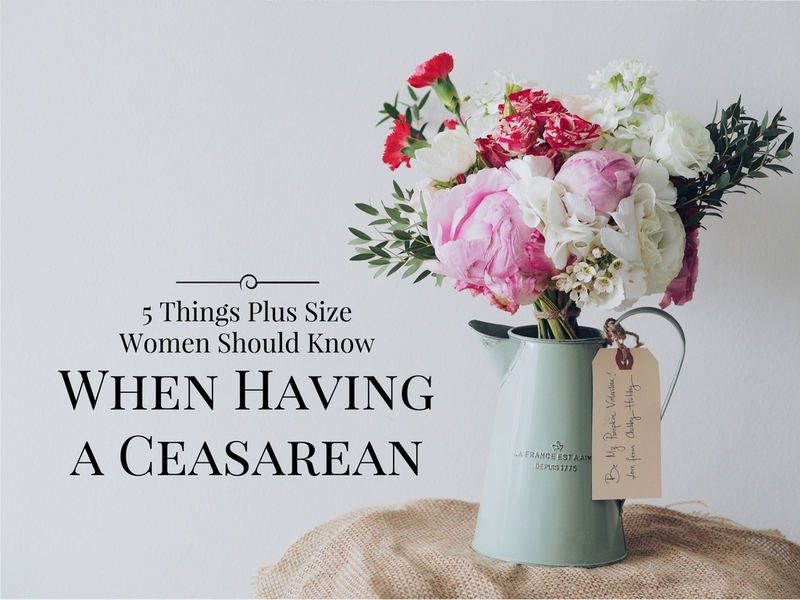 Problems can occur at any size and there can be many factors involved which can make a ceasarean more risky than your average c-section, but for me, the risk was my weight. I didn't die, my baby was born safely and healthy and there were no major complications, but for me, my birth was traumatic and very difficult to overcome in the months that followed. You can read all about my birth in my previous post, 'the birth I didn't plan'. I am not by any means suggesting that you have to be a certain size to birth a baby safely, but my experience has ensured I work hard to change my body so that when we decide to try for another baby, I am not in the same position as before. Just the idea of having a caeasarean as a plus size woman in the future absolutely terrifies me and it's not something I think I could physically do again. As a plus size mum, with a soon to be 5 month old, I can 100% relate to this post, everything you said is true and I only wish more people spoke out about the recovery. I feel my scar is only just healed I was having Midwives come over everyday for 3 and a half months to change my dressing for me as my wound was weeping so much. I wasn't ablebto shower for over 3 months and juat felt dirty and fragile and horrible. This is such an interesting post - I had a section, and whilst I'm not considered plus size I do have a pouch and I still look very pregnant two years on because of how my scar healed and how much my skin stretched. It definitely isn't the easy option. There isn't one when it involves a small human exiting you!